In her new article for the October edition of the “no-nonsense” magazine JAN, Karen van Ede writes about the paradox of caring about the environment and jet-setting around the world for her job as a beauty editor. Raised by a biology teacher father with great respect for nature and an activist mother, principles of environmental responsibility were a pillar of her upbringing– even if things like hanging wash up to dry instead of using a dryer embarrassed her as a teenager. Now, it’s the plastic pollution crisis that keeps her up at night. How does she face this dilemma, and how can consumers do the same? Striking images of the plastic soup, climate change, and overconsumption have moved Van Ede to use her influence as a beauty editor to do something against the plastic soup — especially the plastic soup that starts in our bathrooms. She is doing her part and collaborates with the Plastic Soup Foundation (PSF) by collecting and recycling “beauty plastic” to create sustainable beauty cases (the proceeds of which will be donated to the PSF). Not only that, but she is also raising awareness for the crisis of plastic within the beauty industry. Although she does still travel excessively for her job, which contributes to a large eco-footprint, using her position for good instead of casting a blind eye towards the plastic problem is admirable. Some ways that consumers themselves can fight the plastic soup that starts in the bathroom is by eschewing excessively packaged products, avoiding travel-sized toiletries, and purchasing cosmetics with the “look for the zero” quality mark – this means that there are no plastic ingredients whatsoever within the product. Although the cosmetics industry has become more aware of microplastic pollution, many major brands still add micro- and nanoplastics or other chemical ingredients (to thicken, stabilize, and otherwise manipulate the product). 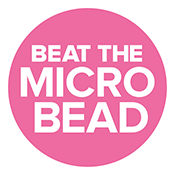 For now, it’s mostly up to the consumer to do their research and buy responsibly, for example by using the Beat the Microbead App. In the words of Karen van Ede, “it may not feel like much, but doing nothing is worse”.